Carnegie Mellon University's Snake Monster robot is based on a modular design. It's more spider than snake, but a robot called Snake Monster can dial up the creep factor when it crawls around on six legs. The latest creation to come out of the Carnegie Mellon University (CMU) Biorobotics Laboratory, Snake Monster can scuttle across the floor and clamber over piles of loose debris. When it wriggles around quickly, it might make you reach for a fly swatter. But this overgrown robo-bug is an example of how machines based on a modular architecture of interconnecting parts can be put together quickly for various purposes, including possible rescue platforms. 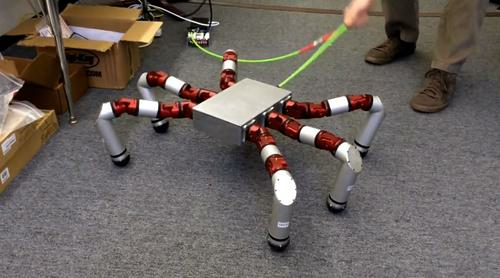 As seen in a YouTube video, the hexapod has a simple design consisting of six multi-joined legs connected to a rectangular box body. It uses an alternating tripod gait to walk around, meaning at any time three of its legs are in the air -- two on one side and one on the other -- while the others are on the ground. When kicked or nudged, it stabilizes itself so it won't fall over. One hardware part that helps it remain stable is the series elastic actuator, which is a motor with a spring aligned with its output shaft. "This allows the mechanism to quickly measure and regulate output torque, as well as protect the motors from high impacts," lead investigator Howie Choset, a robotics professor at CMU, said via email. "When the robot goes over bumpy terrain, the springs in the series elastic actuators allow us to not perfectly plan the footsteps, but rather let the mechanism conform to the environment the way animals do," he said. The research is funded by the Maximum Mobility and Manipulation (M3) program under DARPA, the U.S. Defense Advanced Research Projects Agency. M3 is aimed at quickly designing and producing robots that can move about and manipulate objects in real-world environments. Snake Monster is slated to be demonstrated in June 2015 at the DARPA Rescue Challenge, part of the agency's series of competitions to foster the development of robots that can operate in hazardous situations such as disaster zones. The CMU researchers used their know-how from building several snake-inspired robots with modular joints to develop the Snake Monster in about six months. They liken their modular architecture to the way Ethernet technology acts as an interface between modules, which can be computers working in any language. "It is this commitment to modularity that is going to let us, and hopefully others, develop great robots," said Choset.